Across the world, women continue their struggle to be heard. 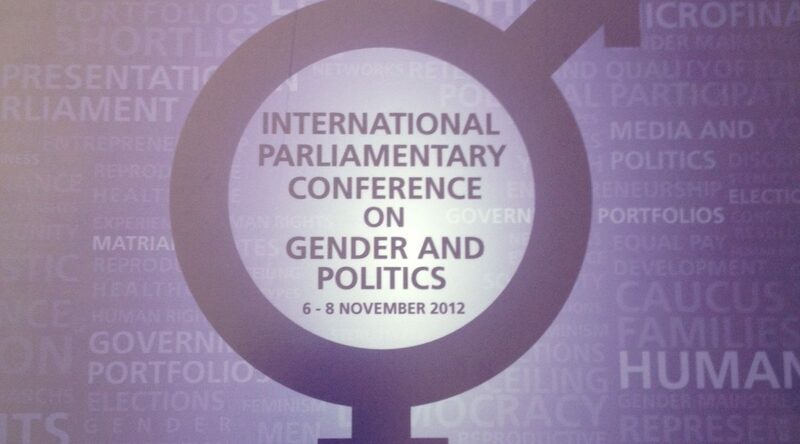 The Inter-Parliamentary Union (IPU)’s Annual Report on Women in Politics 2012 states that the world average percentage for women in national parliaments is 19.7%, with the Nordic countries having the highest average at 42% and the lowest being in the Arab States. 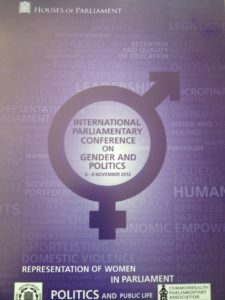 As the largest and oldest organization of members of parliament, one of the IPU’s objectives is to support the increase of women in politics. 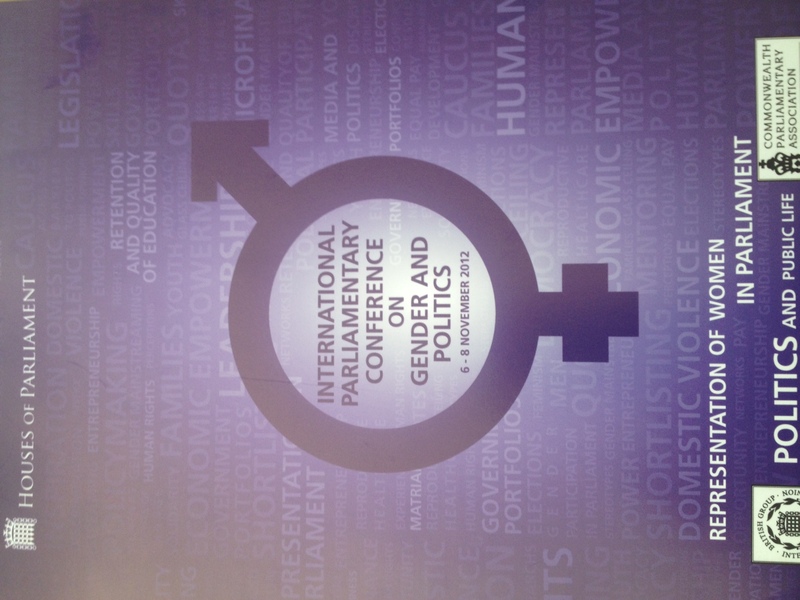 Towards this end, the conference on Gender and Politics was organized by the British Group Inter-Parliamentary Union and the Commonwealth Parliamentary Association UK. 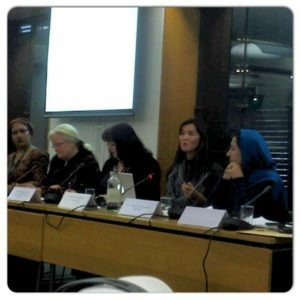 I was invited to be a speaker at the said conference which was held in the Houses of Parliament in London. 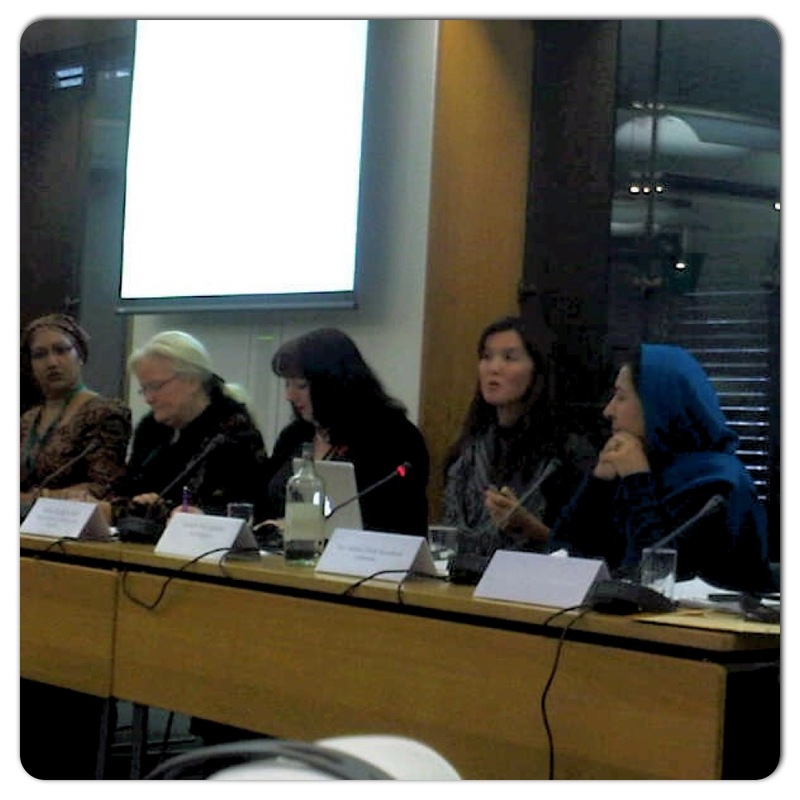 Our panel included three other women parliamentarians. 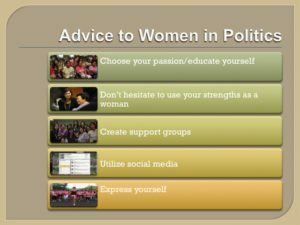 We were all asked to speak of our experiences as a legislator- how we got elected; what were the obstacles; the challenges we face in parliament; the milestones we have achieved; and the advice we would give other women. 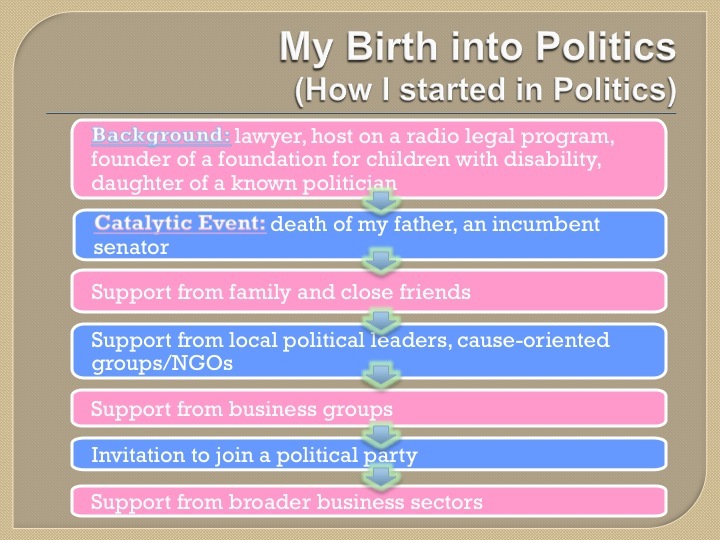 I started with the catalytic event in my life that carved out my path in politics – the death of my father. 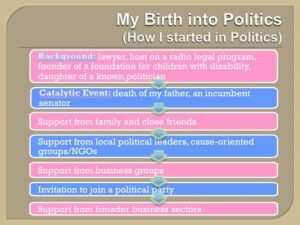 I pointed out that around the world, many women enter politics because of affinity or consanguinity. And even though the Philippines has seen two female Presidents and is very accepting of women in politics, women remain a minority in politics. 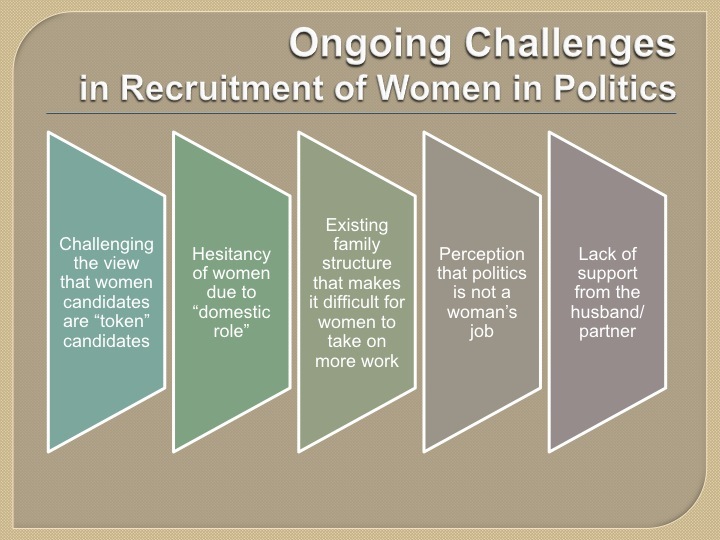 I shared my view that it is still difficult for women to enter politics because of our existing social structures. Women are the primary home makers and politics is seen as a man’s world. For a woman to cross-over, she needs the support of her family and partner. 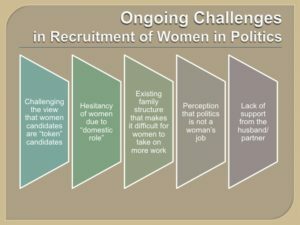 That’s why you will see that many women who do enter politics are wives, daughters, or sisters of politicians. Also important is the support of cause-oriented groups, NGOs and business groups. These are usually groups who share your vision and views and can support you by giving you a venue to speak or even actively support your campaign. Later on, once a woman is elected, this same group will be valuable allies in legislation advocating your common interest. 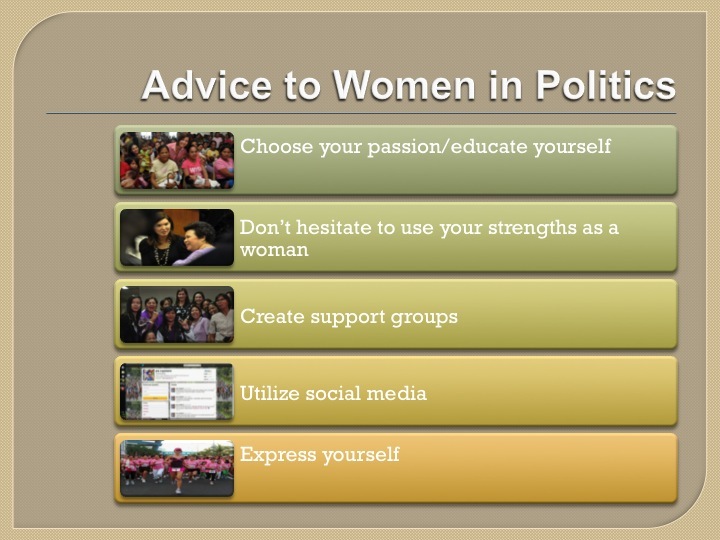 I ended my speech with advice for women in politics. I highlighted the fact that women must educate themselves on women’s issues. It is true that as women, we are innately aware of certain issues that affect us. But we need to understand these issues in depth. We still come from different backgrounds. Some women may have a strong awareness on the issue of violence, others on women’s health or poverty. Many come from a privileged background and although educated, may lack awareness on the problems faced by women living in poverty. Thus, the need to be grounded and to understand the needs of women with different economic and social backgrounds. The other panelists gave very moving speeches. I have heard testimonials of women parliamentarians. They always touch my heart. The parliamentarian from Afghanistan spoke of how her brother and husband disowned her, how she had to fight on her own to run for parliament and how she was doing this to give women a voice. Many women delegates interjected to make a comment or ask a question. They also shared their struggles on the road to parliament and as a parliamentarian– how they were ridiculed for running; how they were considered crazy for taking on a “man’s job”; how they were expected to fail; and how they overcame. I was approached by a number of delegates after the session telling me that my story inspired them. But the truth is, it’s their stories that inspire me.